The Global Volcanism Program has no activity reports for Megata. The Global Volcanism Program has no Weekly Reports available for Megata. The Global Volcanism Program has no Bulletin Reports available for Megata. Megata, a group of three small maars along the tip of the Oga Peninsula in NW Honshu, has been active during the Holocene (Ishikawa et al., 1957). Lakes 300-600 m wide fill the basaltic-to-dacitic maars, which are a noted locality for mantle-derived xenoliths. Ichinomegata, the easternmost, largest, and oldest of the three maars, is 600 m in diameter. Ninomegata and Sannomegata are located immediately east and south of Toga Bay (Togowan), which itself is a maar. The rim of the rhyolitic Toga (Togowan) maar, larger than the Megata maars, is breached by the sea on the western side and was formed about 450,000 years ago. The Megata maars are mostly late Pleistocene in age, but Murayama (1987) noted that pottery from roughly 4000 years before present (Jomon Period) has been found within tephra layers from the maars. Ishikawa T, Minato M, Kuno H, Matsumoto T, Yagi K, 1957. Welded tuffs and deposits of pumice flow and nuee ardente in Japan. 20th Internatl Geol Cong, Mexico City, Sec 1: 137-150. Koyaguchi T, 1986. Life-time of a stratified magma chamber recorded in ultramafic xenoliths from Ichinomegata volcano, northeastern Japan. Bull Volcanol, 48: 313-323. Takahashi E, 1978. Petrologic model of the crust and upper mantle of the Japanese island arcs. Bull Volcanol, 41: 529-547. There is no Deformation History data available for Megata. There is no Emissions History data available for Megata. An aerial view from the NW with Toga Bay in the foreground shows Sannomegata (center), one of a group of the three small Megata maars along the tip of the Oga Peninsula. The names of the three maars, Ichinomegata, Ninomegata, and Sannomegata mean First, Second, and Third Megata, respectively. Lakes 300-700 m wide fill the maars, which are noted localities for mantle-derived xenoliths and are located immediately east and south of Toga Bay. 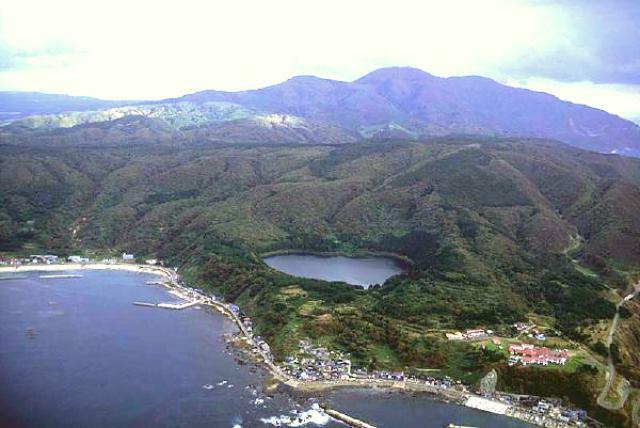 Copyrighted photo by Hiroshi Yagi (Japanese Quaternary Volcanoes database, RIODB, http://riodb02.ibase.aist.go.jp/strata/VOL_JP/EN/index.htm and Geol Surv Japan, AIST, http://www.gsj.jp/). There are no samples for Megata in the Smithsonian's NMNH Department of Mineral Sciences Rock and Ore collection. Large Eruptions of Megata Information about large Quaternary eruptions (VEI >= 4) is cataloged in the Large Magnitude Explosive Volcanic Eruptions (LaMEVE) database of the Volcano Global Risk Identification and Analysis Project (VOGRIPA).